One hundred years ago, you may have been sitting down to a meal consisting of a dozen courses, accompanied by seven fine wines. This meal would have cost the princely sum of 24/- (£1.20p or about US$2.00) per head and your hosts would have been the Worshipful Company of Gardeners. The venue would have been the newly opened Trocadero restaurant in London's Piccadilly Circus, on October 14th 1896 - eight days after the restaurant opened its doors. In 1992, at an auction in Dorchester, we found a dusty old book, somewhat the worse for age. It contained four hundred pages of hand-written menus of the most exotic type, some dating from 1894, but the bulk from October 1896 to late 1899. After a large number of inquiries it turned out that this book was the first Banquet Book of London's famous Trocadero restaurant - affectionately known by millions as 'The Troc'. This opulent restaurant opened in late 1896, by J. Lyons and Co. as a complimentary venue to their tea rooms. It was luxurious, and broke a number of taboos. For instance women were able to dine on their own, and even allowed to smoke - provided they were covered by a screen! Our Banquet Book though begins from December 21st, 1894, with a Press Luncheon for 200 reporters. However we don't know where this banquet, and just over two dozen others others up to October 1896 actually took place, before the book started to chronicle the Trocadero itself. What we do know is that on the same night as the 1894 Press Luncheon is an entry for J. Lyons, a cousin of the Trocadero's owners, who lent his name to the famous company and played an active role in its development. Presumably he too was trying the wares! It also links these early meals firmly with what follows later in the Trocadero itself. J. Lyons and Co., which owned the Trocadero, was created by tobacco merchants Alfred and Isidor Salmon and Montague Gluckstein. Their names appear regularly in the book, and the three banquets in one day for the marriage of Mr Gluckstein's daughter catered for up to 400 people with luncheon, dinner, and a post ball dejeuner, served at 0230hrs. Click here to find out more about the actual restaurant and the building or you can also click here to find out more about the history of the site and how the restaurant came about. Much can be gleaned of the ingredients - real turtle was popular - and The Banquet Book covers meals other than dinner, and as well as luncheon, high tea were clearly a favourite with Victorian Society. This meal generally began at 1600hrs, and included up to eight types of sandwich, a course of cakes, French pastries and biscuits, and a course of macaroons. Drink was important, and bearing in mind the time of day, often on offer were port, sherry, brandy, Irish and Scotch whiskies, claret, claret cup, and tea and coffee with cream. Lemon Squash and Mineral Water were also available. Many of the meals (about a quarter) are Kosher. Mr Lyons had a souffle created in his honour. Others such as Sarah Bernhardt, the actress and Cecil Rhodes, namesake of Rhodesia, and South African Prime Minister were also so honoured. Significant though the food is, the wine is as surprising. 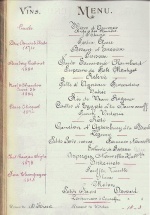 The Trocadero was the first public London restaurant to have a full wine cellar, and had some exceedingly rare stock. Clearly not everyone in France fought at Waterloo in 1815, peasants still toiled in the vineyards, as the Trocadero had in its vault an Napoleon Fine Champagne Brandy, of that year. It was made by Courvoissier according to the Banquet Book - indeed most of today's great houses such as Pol Roger and Moet & Chandon are mentioned. It had been our wish to have some of these 940 (of which about 900 relate to the Trocadero, and others as explained above are a mystery so far) menus published, together with recipes for recreating them, and historical notes of what was happening in the world that day. It would thus be possible to recreate the meals, exactly a century on - here's an example. However we can find no agent or publisher who shares our enthusiasm despite an edition of the BBC Radio Four Food Programme and other media coverage which featured our find! 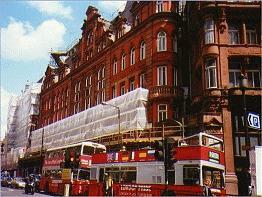 Not many other sites cover The Trocadero, but we've put what we can find as links here. Click here to go to the front page.